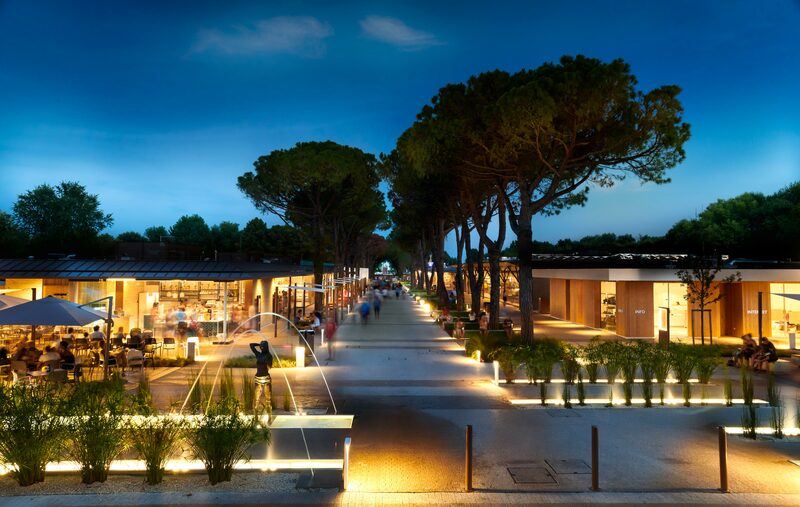 Marina di Venezia celebrates its 60th anniversary and on this occasion we have built a new promenade. The architecture armoniously blends with the nature and the surroundings. Wooden and glass surfaces create a bright and fresh atmosphere. The project involves an area of 20.000 square meters: on 300 meters of it you can find newspapers and tobacco shop, supermarket, bakery, greengrocer and flower shop, fish shop, bazar with camping goods, clothing store, shoe shop, sport shop, hairdresser for women and men with a beauty section, Murano glass shop, photographer, two restaurants, two ice cream parlours, 3 bars, a parapharmacy, animation office and the stage. Since 2013 when we built our Garden Villas and then in 2015 with the Restaurant PiacerMio, the Reception area in 2016 and in 2017 3 beach bars and a beach restaurant we keep on following the specific design and style of the archistar Matteo Thun and of the architect Luca Colombo.